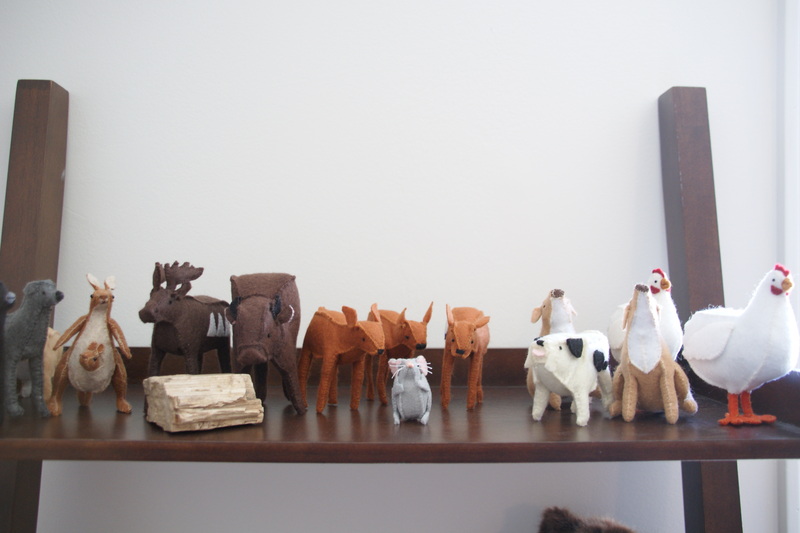 I would almost always choose to make a handmade decoration instead of buying something off the shelf. I just wanted to share a few things that I’m enjoying in this year’s collection. 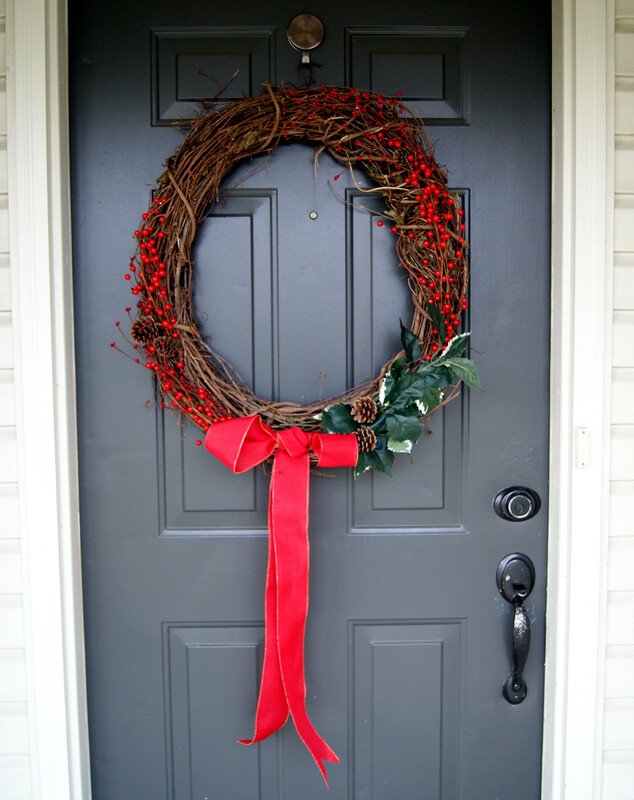 One of the simplest “DIY” projects I did this year was a wreath for our front door. My husband Mark and I just gathered some items from the floral section of our local craft store and wired them together, but I love it. 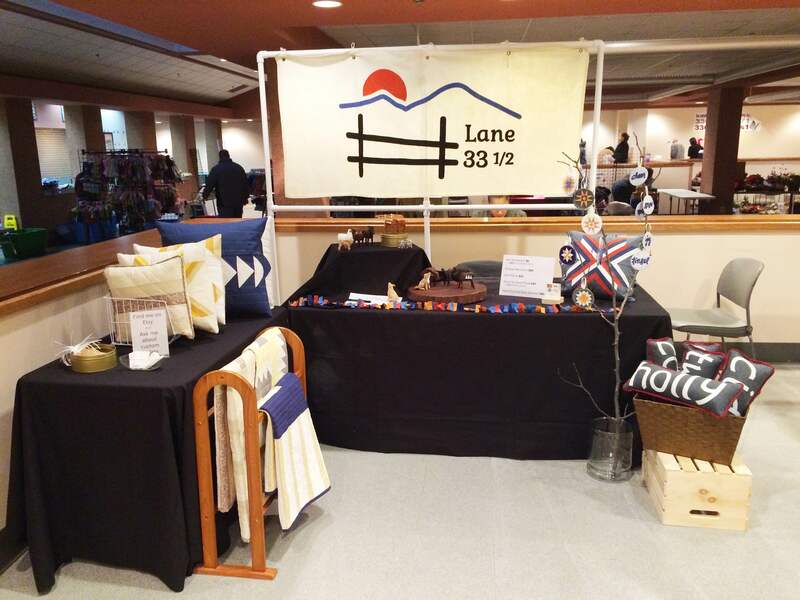 Especially because we did it together – crafting is not usually my husband’s jam. Beyond the wreath, Mark and I like to stay away from too much traditional “red and green” and instead celebrate winter more broadly. 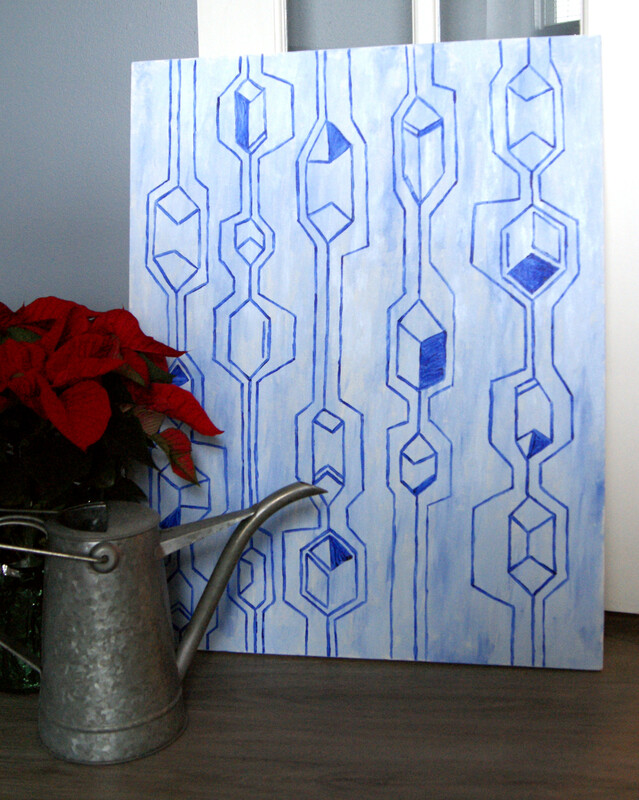 I painted this canvas after being inspired by a similar design in last year’s West Elm catalogs. Just simple and geometric, but somehow reminds me of ice and cold. It sits by our fireplace. 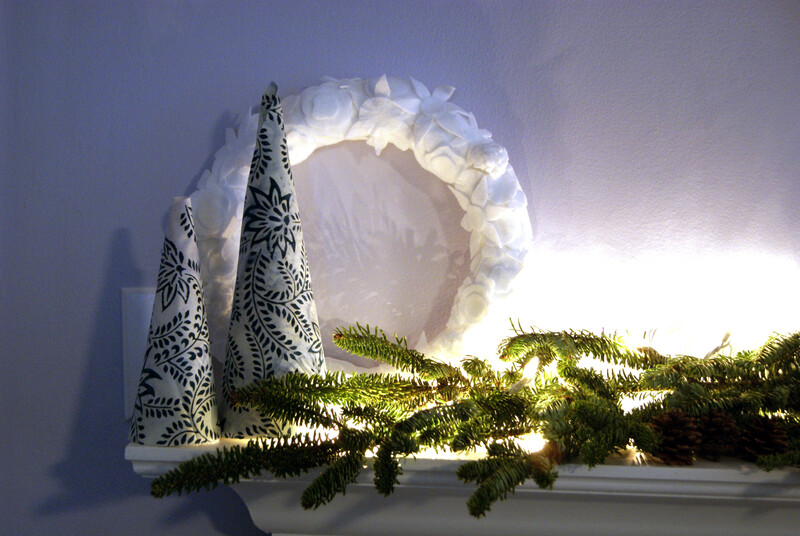 I also made these simple “trees” with a wintery fabric wrapped around cones. We will be traveling to see family this Christmas, so we decided to go for a smaller tree at our place and keep things simple. 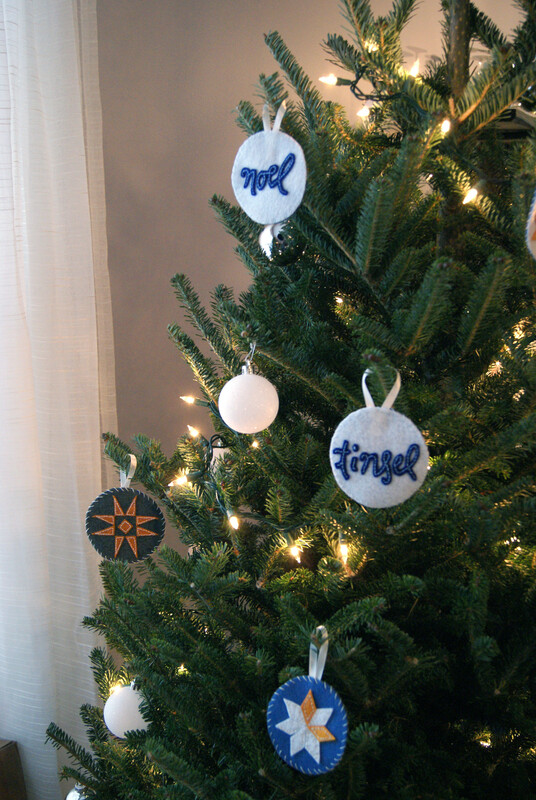 I decorated with hand-sewn felt ornaments that give a nod to my love of Scandanavian design, quilting, and hand lettering. Check out my Sew Mama Sew giveaway today by going to my Instagram to win a set of five hand-stitched ornaments (open through Sunday Dec 13th)! I also am working on some other simple ornaments created with paint pens and Sharpies on clear plastic orbs. Hopefully some pictures to come soon on Instagram! Since this is our first holiday season in the house we purchased this year, I decided it was time to make some stockings for our family. When I was younger, we would celebrate Christmas every year with my maternal grandmother, Eleanore. She was always someone who made things by hand, albeit in the “quick and dirty” fashion. She took a lot of pride in decorating stockings for every new member of the family by cutting Christmas tree shapes, slightly wonky candy canes, and lopsided stars out of felt and gluing them down. 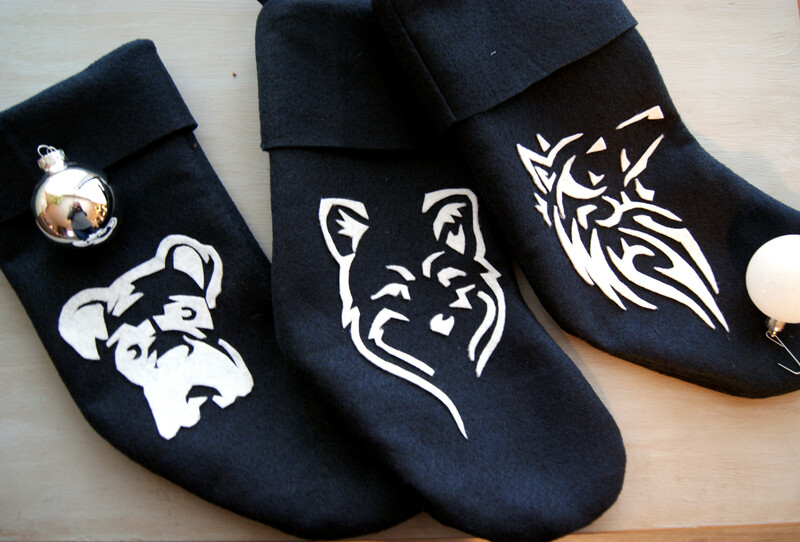 I tried to take this “tradition” in my own direction by making my own stockings from navy felt and decorating with our little “dog pack”. I’m the fox, Mark is the wolf, and I’m betting you can guess which one is Gideon, our boxer! 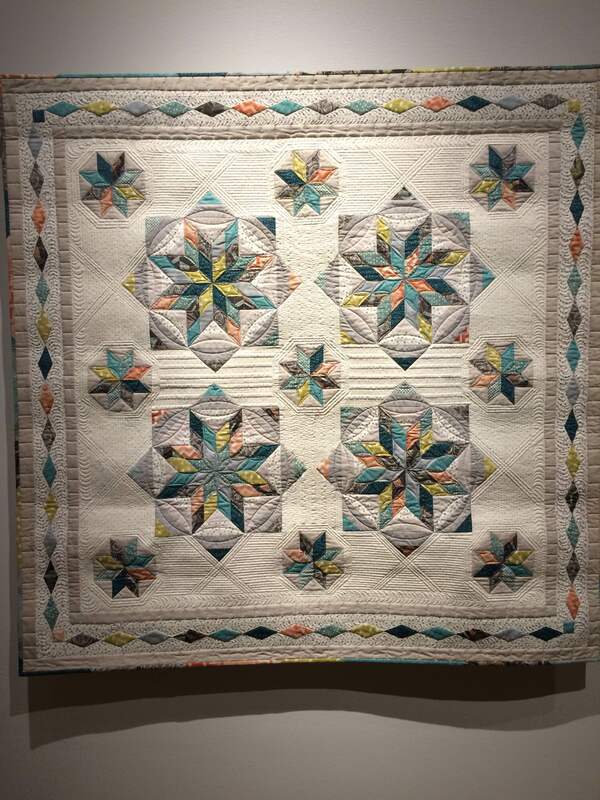 Just before it’s opening day, a few friends from the Indianapolis Modern Quilt Guild and I got a sneak-peek at this fantastic new exhibit at the Indiana State Museum: 19 Stars – Quilts of Indiana’s Past and Present. The exhibit divides quilts into two sections: “past” and “present” which each get a gallery across the hall from one another. 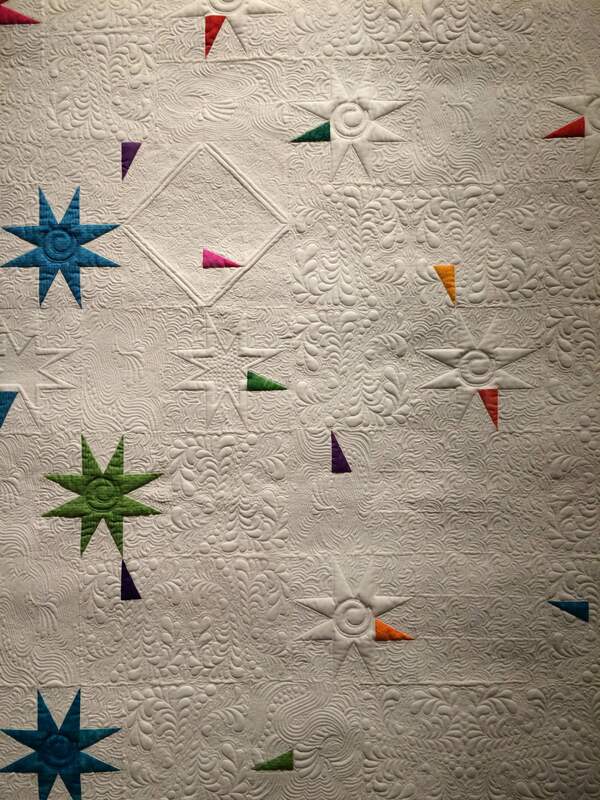 Every quilt has some kind of representation of a “star” and is made in Indiana. 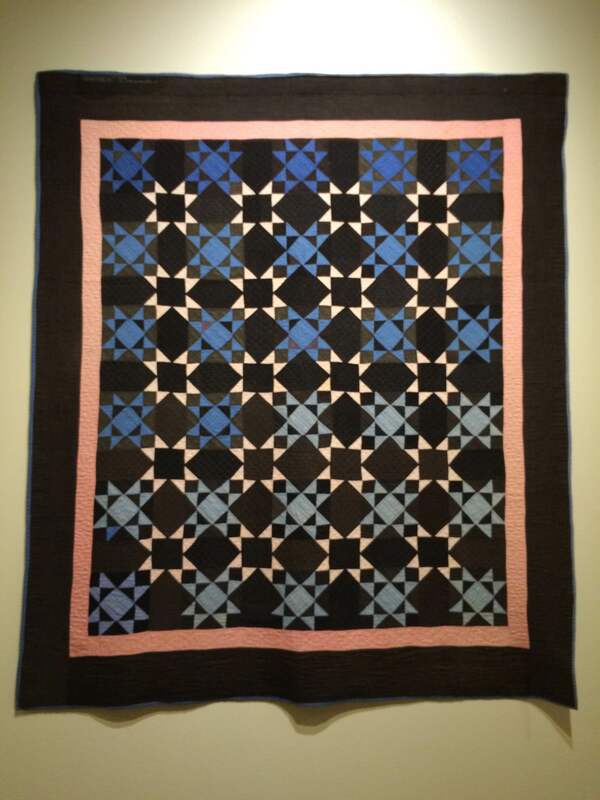 As we wandered through, we began in the “past” section which highlights some very beautiful and moving Amish quilts along with others made between the 1830s and the 1980s. 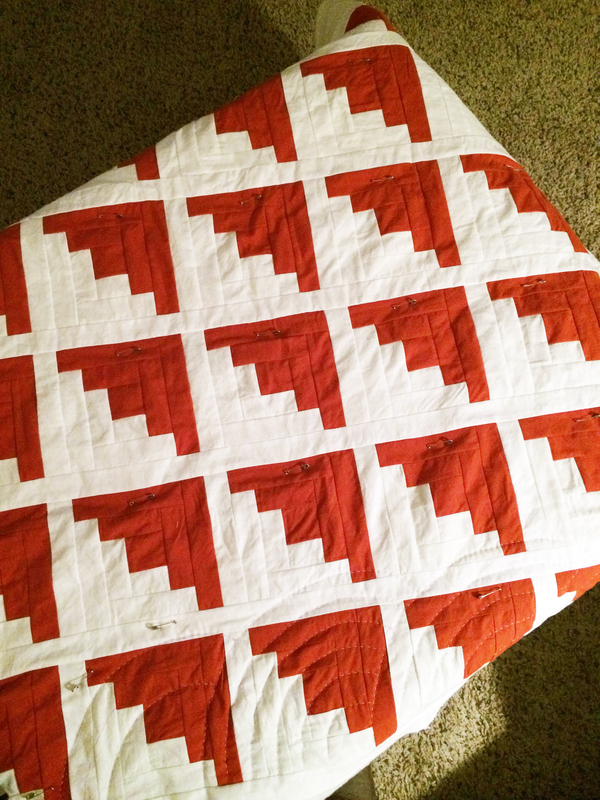 I loved the simple and utilitarian look of these quilts (as I always do) and was amazed (although maybe this should have been less surprising) that all these quilts were hand-sewn. I guess many quilters weren’t using even the earliest machines at that point! We then moved to the “present” section. 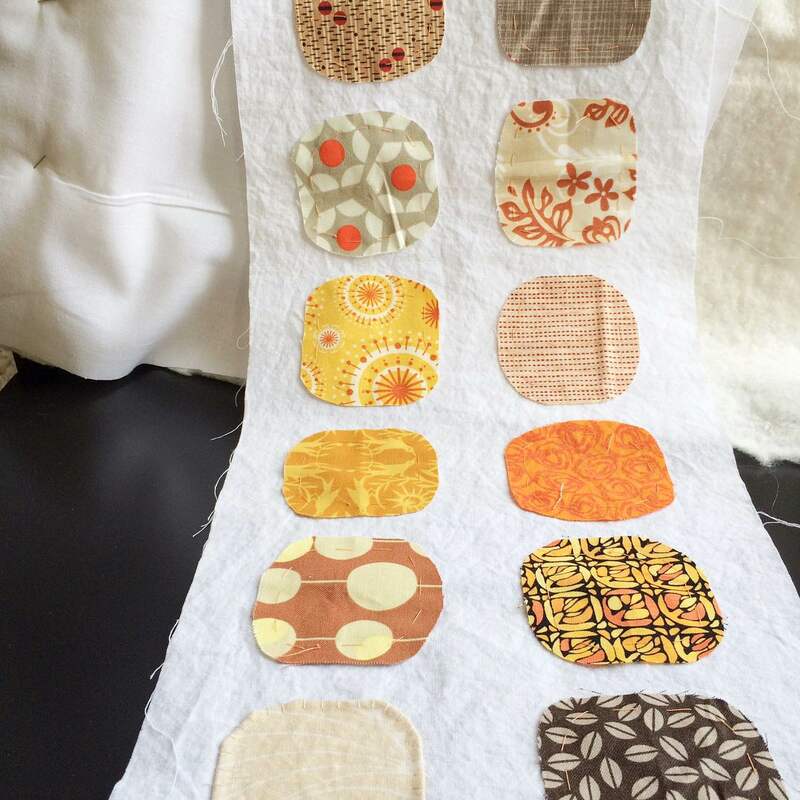 As a “Modern” quilter, some of these resonated with me as “my style” and others didn’t. However, I found them all to be interesting especially because these current-day quilts had been commissioned specifically for the exhibit. This meant that each one was a representation by the quilter of his or her style, the way that they wished it to be kept for posterity. One of the things I found myself wondering would be how we would sequence these quilts if we tried to line them up from “traditional” to “modern” in terms of design and aesthetic instead of their date of creation. I imagine the exhibit would be organized quite differently! Some of the quilts made since 1980 are much more “traditional” in their color schemes, design, and fabric choices than the older ones! 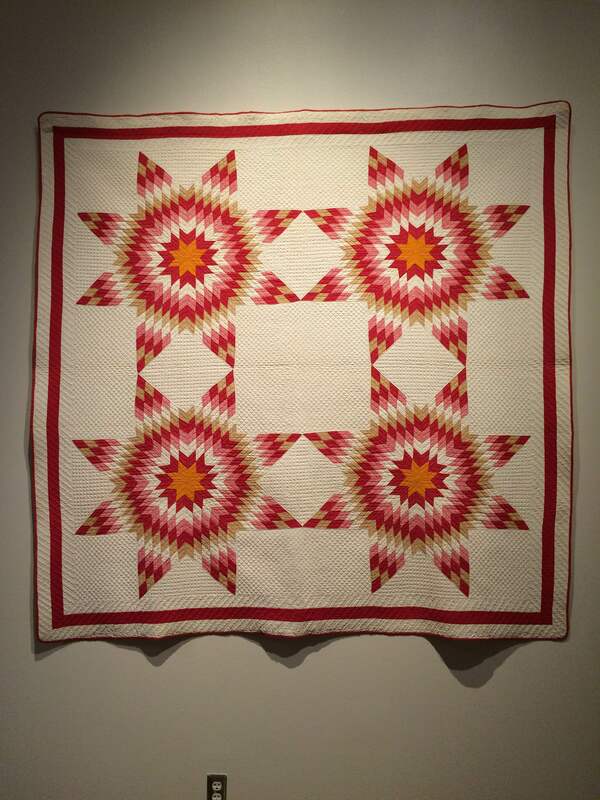 I also wondered how we can get MORE Modern quilts in shows like this!! How do you “modernize” something that still speaks to the heritage of heirloom designs? 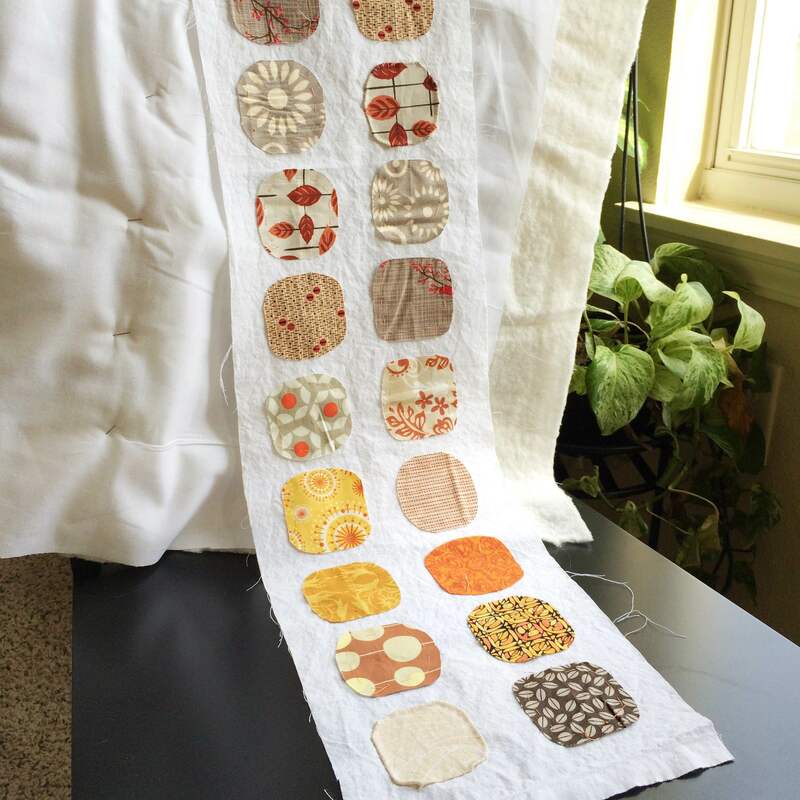 As a member of the “modern quilting movement” how do I keep improving the way I distinguish “modern” from “modern day” when I talk to non-quilters? 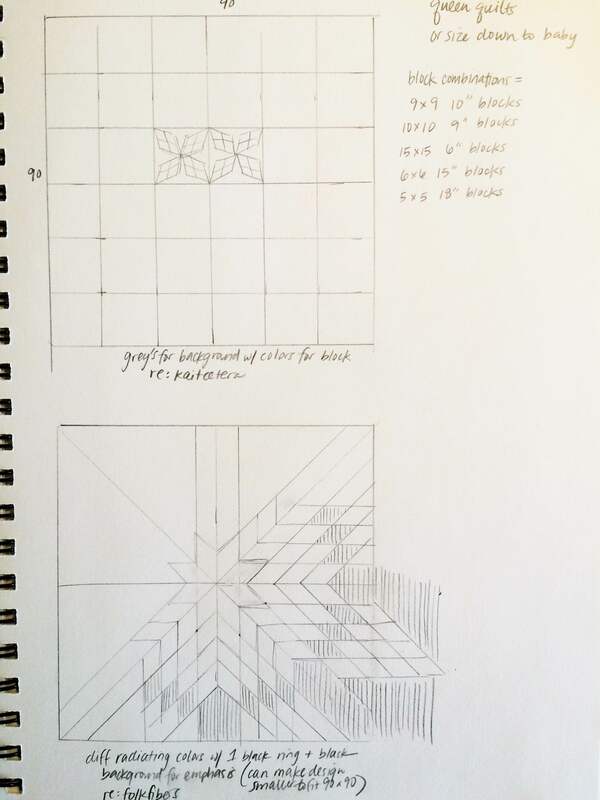 What is the best way to utilize and love quilts in their lifetime and still save some to pass down to future generations? 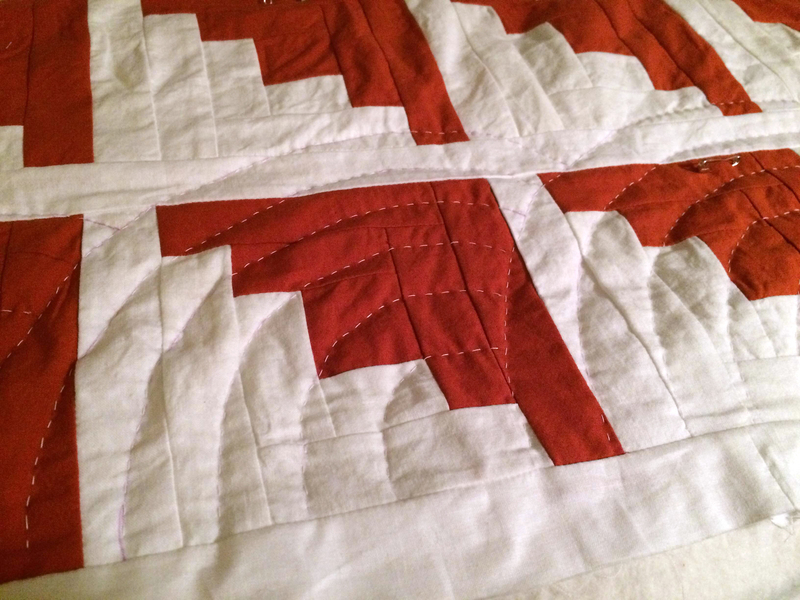 What stories and documentation should we keep with our quilts to give them context and meaning when those future generations pull them out of an old closet? So, over the last few months, my sewing has had to take a back seat. My husband and I went through a house-hunting process, purchased a home, and have been doing updates. Although this all was time consuming, sometimes stressful, and a lot of work, it is an extremely exciting time. 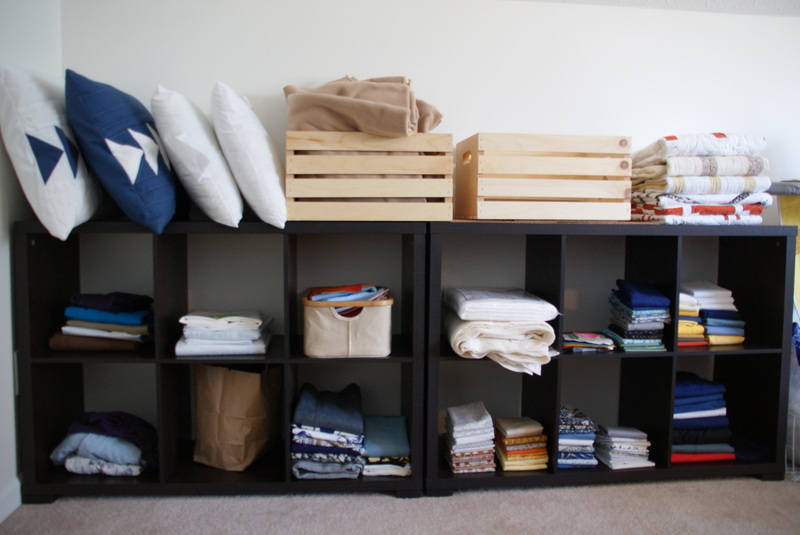 We both love to do projects that make a place “ours” and this one has tons of potential! 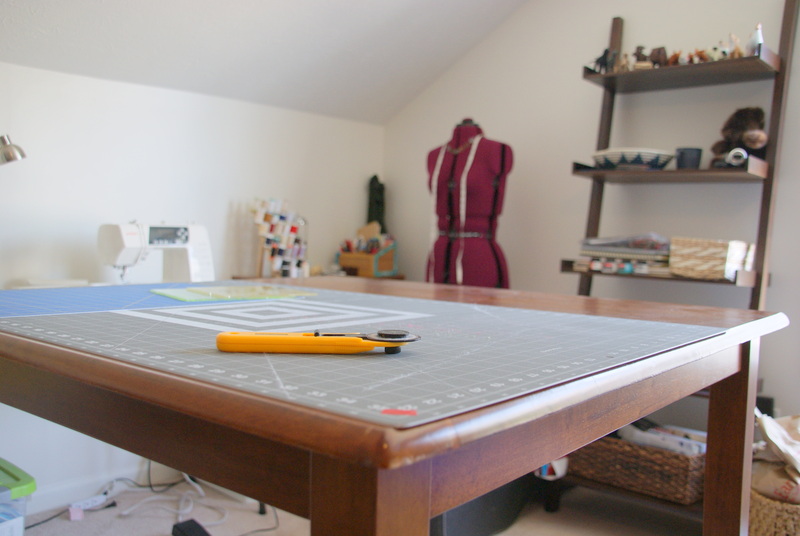 The other “light at the end of the tunnel” is that I knew our new place would have to have a great creative area for my sewing and my husband’s hobbies. We aren’t ALL the way there yet, but I wanted to show off what I’ve set up so far. This room is our “bonus room” on our second floor above our garage. We repainted it all white to give it as much light as possible and set a neutral background for colorful projects. My bookshelf contains some of my most prized possessions. In our family, books have always been a centerpiece and I collect books both for inspiration and instruction on a wide variety of creative interests. My cutting table (our old raised eating table) has plenty of room on all sides and gets me on my feet. I aimed for a triangle between cutting, sewing, and ironing. 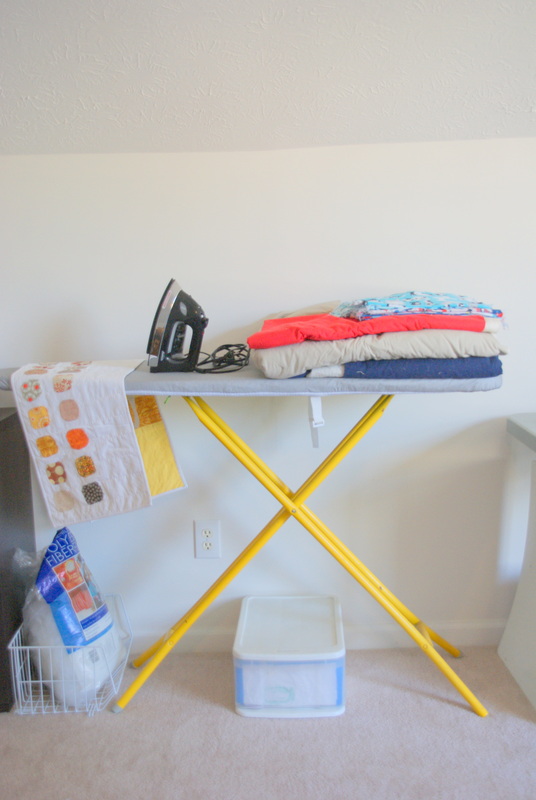 My ironing board was a gift from my mother-in-law. It was hers when she was my age and has the squeaks and retro yellow legs to prove it! I’ll be doubling this surface area when our other folding table gets rescued from underneath tons of tools and paint from our renovations! 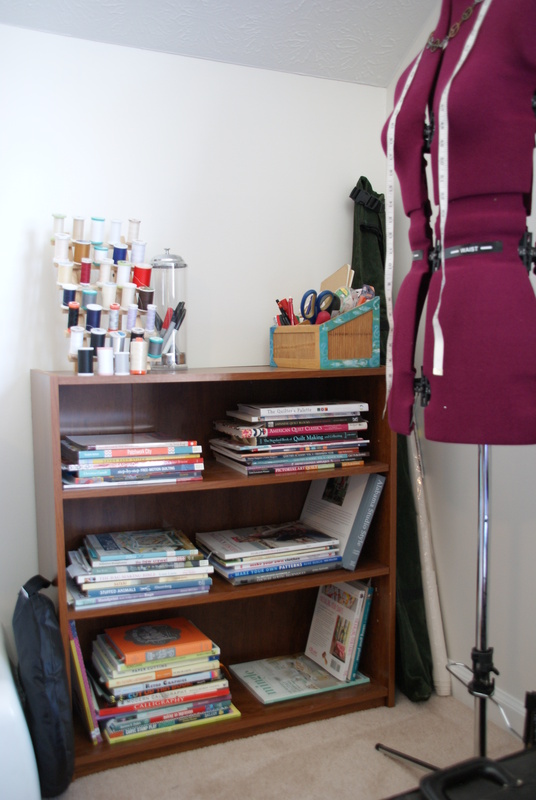 One of the great additions to the space are these shelves that finally allow me to get all my fabric “out of hiding” and really get a feel for what I have on hand. We get great sunlight during the day in here, but I’ll need to add more lighting, move our small couch in for hand-quilting next to a cuddly dog, and find the best places to hang some art. 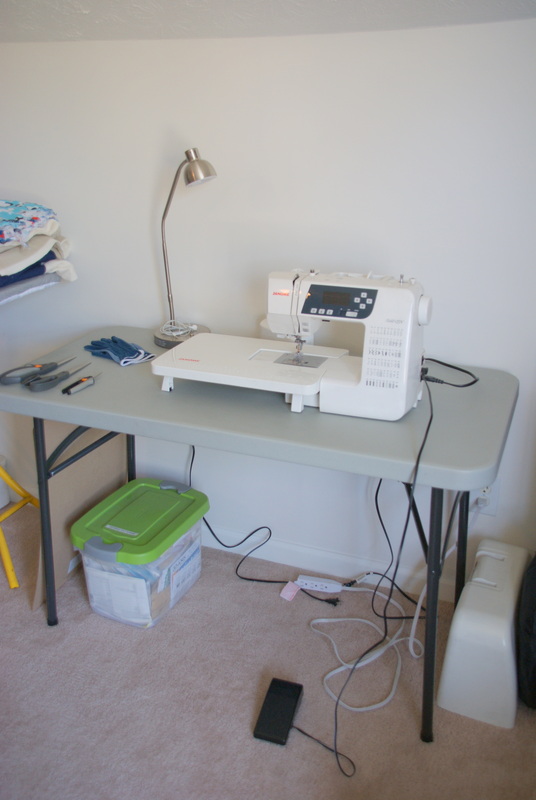 I’m also on the hunt for a new sewing chair! 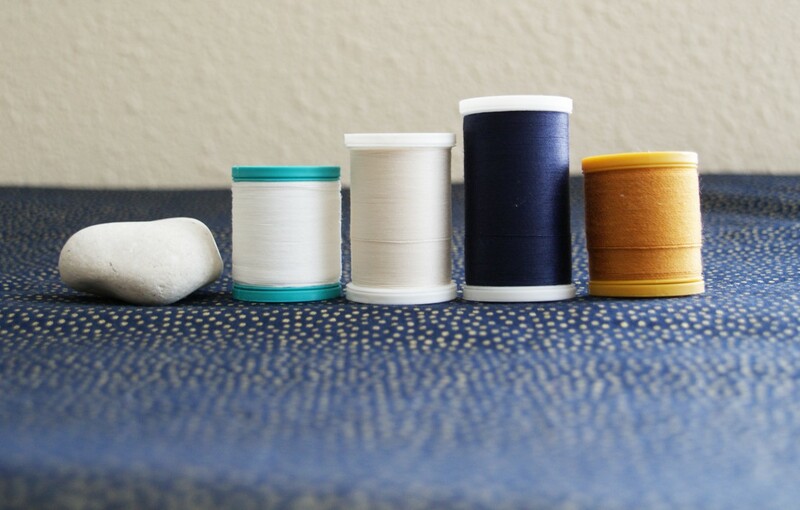 Any suggestions from YOUR sewing room? 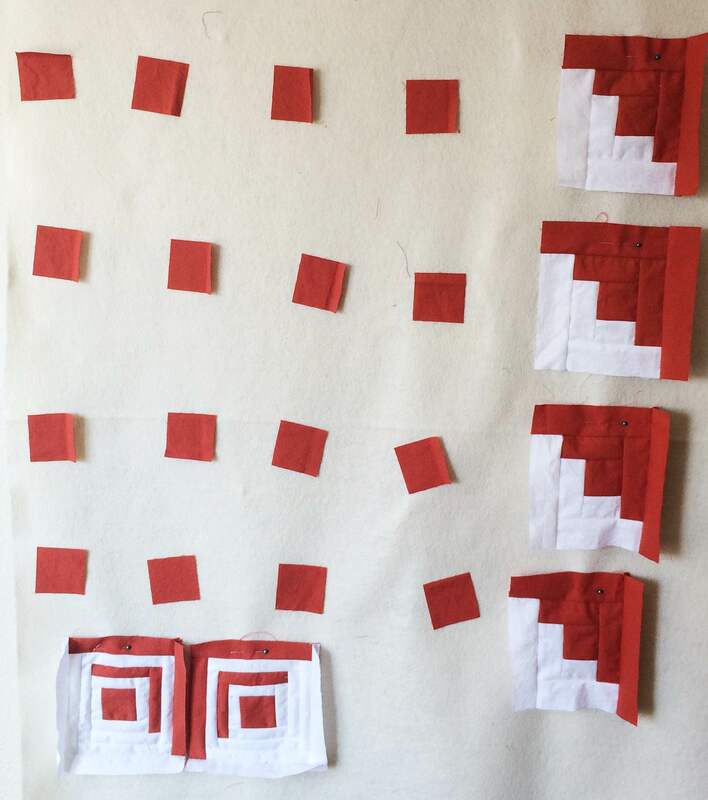 So, this week I started what I plan to be a three-part series where I explore variations on red and white log cabin quilts. They will all be the size of wall hangings and I will machine-piece and hand-quilt them all. 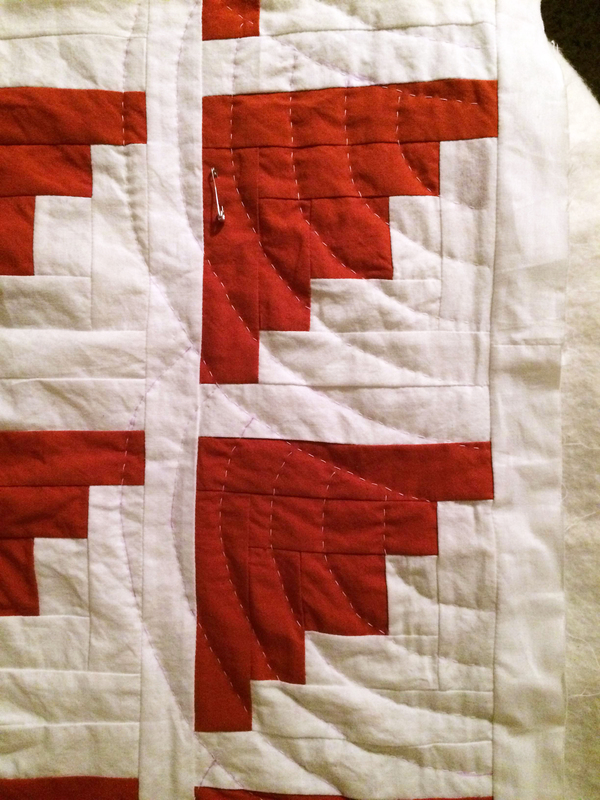 I wanted to do this because red and white can be so amazingly graphic and allows me to highlight the possibilities of simple variation in piecing and quilting within a very tightly specified set of parameters. 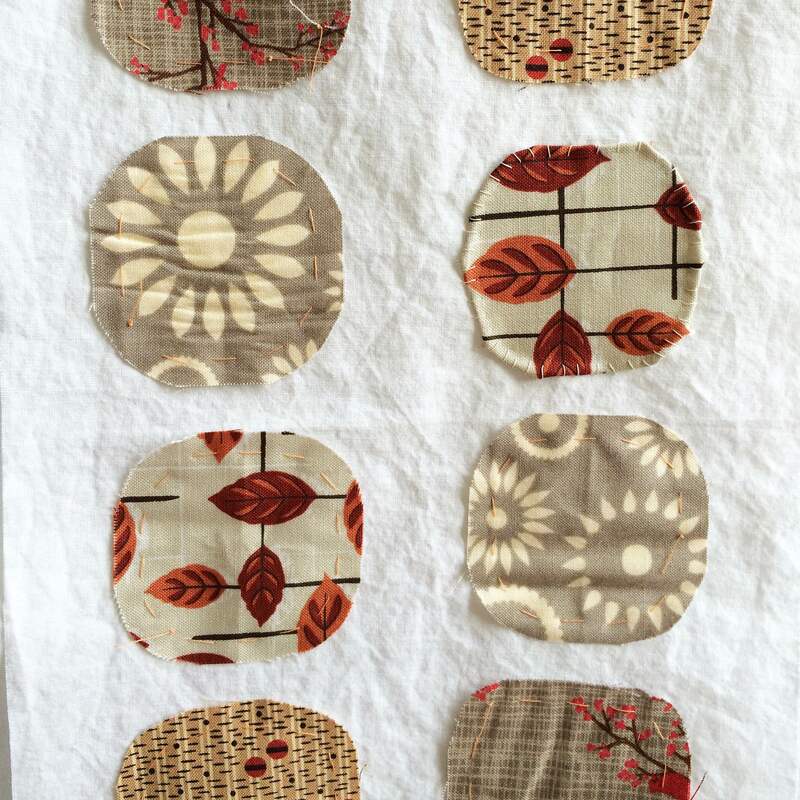 Today’s slow stitching has been to start hand quilting my pieced top. The pattern (Baptist Fan or Sashiko, depending on what tradition you pull from!) is such a fun way to have an organic and round shape interplay with this highly regimented square Log Cabin. Looking forward to how the dynamic looks on the full top.